Two Licensed Massage Therapists travel to your private cabin, by appointment, for a one hour massage for 2 guests. Your choice of in your cabin or outside on your deck (weather permitting). 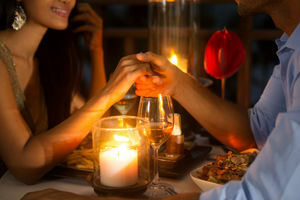 Romantic Dinner & Champagne Toast: Enjoy fine dining? Dinner reservations, no waiting, seated at a Decorated Table for 2 with white linens & candles. Choice of Entrees': 12 oz Charbroiled Rib Eye Steak, Baby Red mashed potatoes, Chef's Selection of vegetables; Shrimp, Chicken & Grits, Low Country Atlantic Salmon flame grilled & blacked over Baby Red mashed potatoes; Chicken Florentine featuring creamy Penne Pasta tossed with grape tomatoes & fresh spinach; Roasted Mediterranean Portabella all prepared by award winning chefs. Includes fresh garden salads, freshly steamed vegetable, potato, hot dinner rolls & butter, Champagne Toast, Chef's Choice Desserts for 2. Dress casual or formal! Snuggle & snooze a little longer! Depart at Noon. 2 layer Cake, Happy Anniversary Banner, 2 Keepsake Engraved Honeymoon Hills champagne flutes & Sparkling Cider, bed decorated with balloons and silk Rose Petals with a trail of Rose Petals leading from the door to your decorated bed. 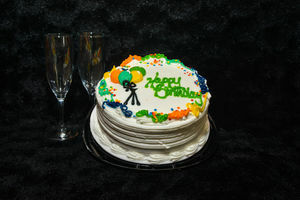 Perfect for Birthday, Anniversary, Congratulations, or simply say I Love You in a fun, whimsical way! 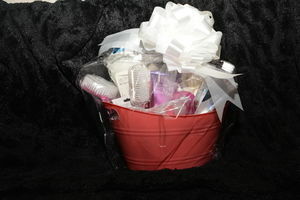 Surprise her with a Romantic Basket of Goodies for your Jacuzzi. Enjoy relaxing in your jacuzzi tub with our Exclusive Assortment of Pampering & Bath Favorites! Celebrate with a freshly baked birthday cake awaiting your arrival at the cabin! Surprise them for their birthday and say 'Happy Birthday' with a freshly baked Birthday Cake, Happy Birthday Banner, your jacuzzi tub is filled with balloons and an enticing trail of silk Rose Petals leading to the jacuzzi! 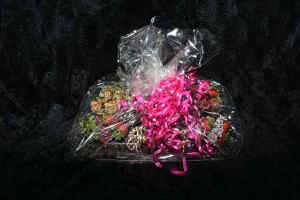 A generous assortment of all your favorites - strawberries, cherries, Oreo's and pretzels - all freshly dipped in chocolate! A chocolate lovers dream come true! A quart of Genuine Smoky Mountain Moonshine distilled right here in the Smoky Mountains! 2 - Keepsake Moonshine Red Solo Cups, Pork Rinds, Nuts, Whole Dill Pickle, Cheese & Crackers, Slim Jim, Deck of Playing Cards, Pair of Dice. Perfect for sippin' in the hot tub! 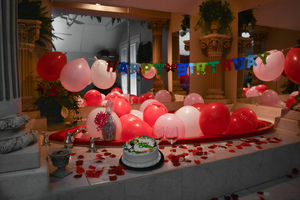 Surprise 'em with the jacuzzi tub filled with balloons! The perfect keepsake to enjoy for years to come. 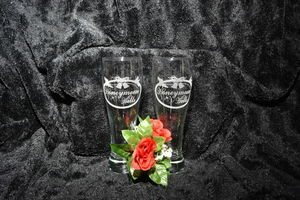 Set of 2 engraved Honeymoon Hills Pilsner beer glasses. 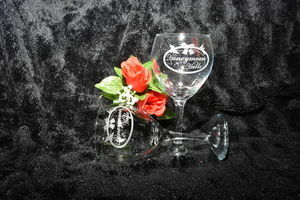 2 Keepsake Honeymoon Hills engraved Toasting Glasses of your trip to Gatlinburg, TN. 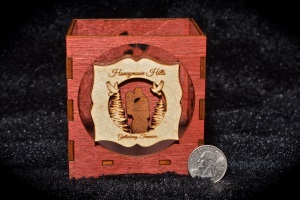 Take home a wonderful keepsake of your trip! Set of 2 engraved Honeymoon Hills wine glasses. A Licensed Massage Therapist travels to your private cabin, by appointment, for a one hour massage for 1 guests. Your choice of in your cabin or outside on your deck (weather permitting). Snuggle Up with your Sweetie for a relaxing evening in your cabin! 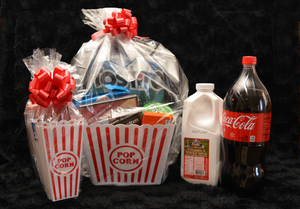 Enjoy 4 Movies on DVD (yours to keep), Tortilla Chips & Salsa, 2 large boxes of Movie Candy, Microwave Popcorn with Keepsake Popcorn Bucket, Milk & Chocolate Chip Cookies with a 2 Liter of Coca-Cola. Ready to put a ring on it? 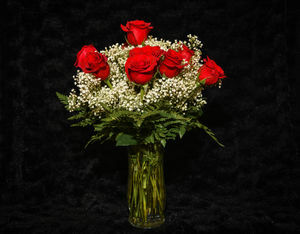 Let us decorate and photograph the event! 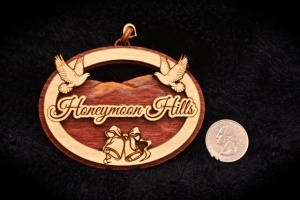 Package includes the photographer for a 30 minute photo shoot with images on a CD and copyright release. We decorate with 2 balloon bouquets, 'Will You Marry Me' banner and rose petals. Several photo shoot locations available. 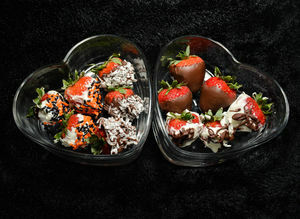 Enjoy freshly prepared Chocolate Dipped Strawberries, romantic 2 person Cake, your bed is decorated with balloons and silk flower petals all delivered to your cabin, arranged and awaiting your arrival! Great for your first morning! 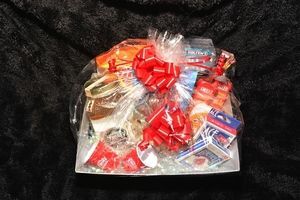 Sleep late then enjoy fresh bacon, eggs, hash browns, gourmet muffins, bananas, apples, oranges, sandwich meat & cheese, bread for toast or sandwiches, milk, orange juice, coffee & 2 Honeymoon Hills Keepsake Toasting Glasses in your cabin! Enjoy an old fashioned picnic on your private deck at your cabin or one of the many picnic locations with breathtaking views in the Great Smoky Mountains National Park. We provide driving directions to one of the most popular picnic places in the Great Smoky Mountains. We prepare fresh sandwiches, potato chips, fresh fruits, chocolate chip cookies, sparkling cider, and 2 Honeymoon Hills Keepsake Engraved Toasting Flutes for your romantic picnic for 2. 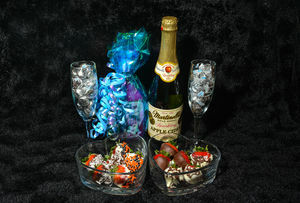 Pamper your Princess with a Bottle of Wine, Smoky Mountain Cork Screw, freshly dipped chocolate cherries, cheese & chocolate bar, a bottle of bubble bath and a Keepsake Honeymoon Hills engraved Wine Glass. Perfect for the jacuzzi tub! Chapel at Honeymoon Hills Wedding Ceremony Package Includes choice of venue (gazebo with bridge across mountain stream feature or chapel) photos, bridal bouquet, boutonniere, 2 layer wedding cake, DVD of ceremony, and one hour; limited number of guests. Call 865-436-3901 for availability. Chapel at Honeymoon Hills Wedding Ceremony Package Includes choice of venue (gazebo with bridge across mountain stream feature or chapel), half hour, 15 photos of the wedding ceremony including 5 posed pictures; limited number of guests. Call 865-436-3901 for availability. Chapel at Honeymoon Hills Wedding Ceremony for Bride & Groom only--no guests. 5 photos of the wedding ceremony. Call 865-436-3901 for availability. Chapel at Honeymoon Hills Wedding Ceremony Package for up to 25 guests including bride, groom and attendants. Includes choice of venue (gazebo with bridge across mountain stream feature or chapel) photos, bridal bouquet, boutonniere, 2 layer wedding cake, DVD of ceremony, and one hour; Romantic Dinner reservations for two including dessert and champagne toast. Call 865-436-3901 for availability.